So I go to a rare cave and when I exit I fall through a seam in the floor. My character is stuck perma-falling through the earth. I have been through it before, the problem is that I am not dying. I just keep falling and getting disconnected. Then when I log back in I am still falling. Rinse and repeat, no way to start over. 77 Mulberry is pleased to present new works by Jason Isolini and Gregory Nachmanovitch in their first two person exhibition in New York. Isolini’s spherical photographs function as Google street views. These works are guerilla-installed online directly into Google Maps. Hovering over the address of a midtown Amazon fulfillment center awaits the dystopian scene of an air-based cargo ship. Pulled directly from Amazon’s Patent: US9305280B1, this airborne depot dispatches drones for just-in-time deliveries throughout the city. Isolini’s images explore the internet of things and today’s private-as-public digital infrastructure. His scenes are slapstick tales of innovation gone wrong. They detail the woeful misallocation of resources, increasingly directed toward consumer convenience as we cede ground to ever more dire economic and social conditions. Nachmanovitch’s Free Agency is a playable computer game and video short. His virtual world invites players to explore a fractured landscape in three acts. A hulking avatar learns to interact with his environment where looking or touching triggers shifts in topology, identity and location. Nachmanovitch unearths the implicit themes of hyper-masculinity that are foundational to gaming culture and the online world. His work forces us to make explicit connections between the subjectivities cultivated within digital environments and their horrifying political realities. The past few years have seen a decisive shift from the techno-optimism of the early twenty-teens. Unregulated and largely ignored digital spaces have since metastasized to such an extent that their impact on our daily lives hasbecome impossible to ignore. These artists sketch unenticing visions of the future: infrastructural strain under declining rates of profit and psychologically rigid spaces which work to normalize unrestrained expressions of power. One has to wonder if there is a way to escape our current condition or if we will continue our unabated fall through the earth. Jason Isolini earned his BFA from the School of Visual Arts in 2016. 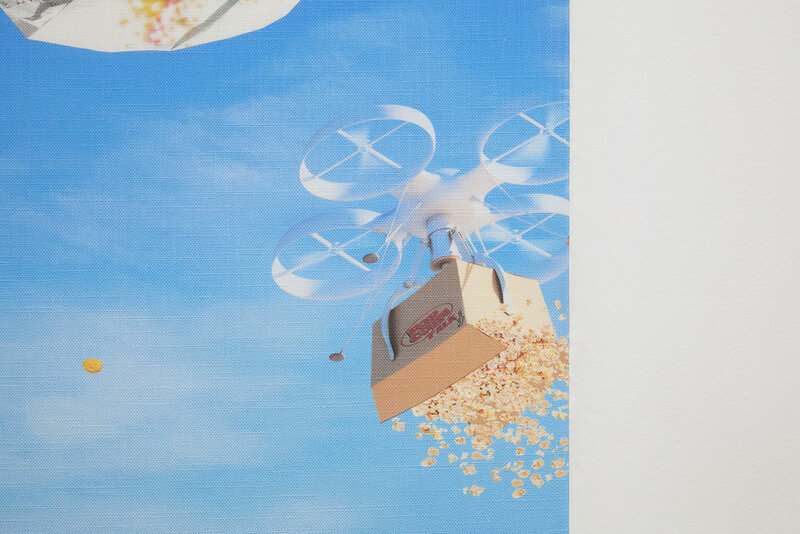 Recent exhibitions include Offsite Project’s “A Spime We’re Living in?” and “Terms and Conditions May Apply”, Anna Kultys Gallery, London, UK. Isolini lives and works in Brooklyn, NY. Gregory Nachmanovitch is a BFA candidate at Pratt University for 2019. Recent exhibitions include Comp USA Live, “Episode 8: Too Much Tech”. Nachmanovitch lives and works in Brooklyn, NY.